Banarasi Lehengas are the newest most sought after bridal lehengas of 2018. Almost every third bride has asked me some question related to shopping Banarasi Lehenga. The big question, however, is the price of banarasi lehengas. 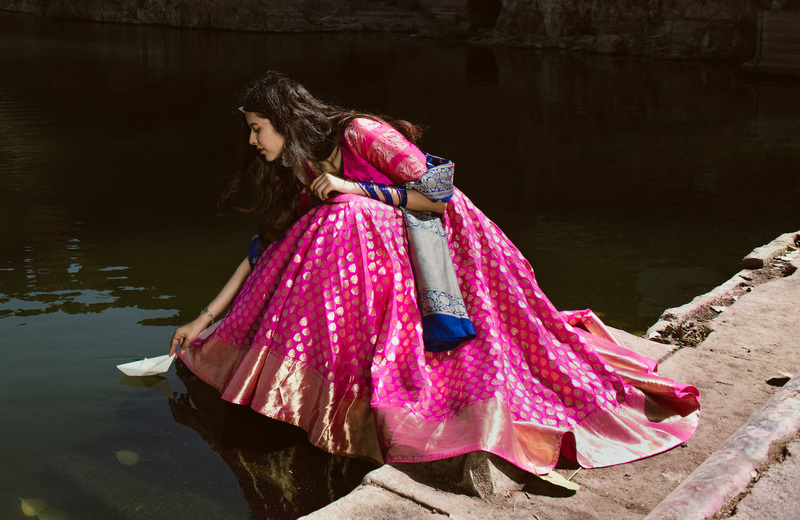 You can get banarasi lehengas starting at INR 5,000 up to INR 2 Lakh+. Depending upon the banarasi fabric and the design, there is a lot of variation in terms of price. There are a few basics that you must know about shopping for Banarasi Lehenga. Banarasi fabrics come in four different varieties. Banarasi Pure Silk also known as Katan. It is made using the purest form of silk threads. Now, these are just fabric varieties. These fabrics are then further processed into different types of work. I found this really nice article online which describes Banarasi Fabrics in detail. If anyone is interested, you can definitely check it out. Honestly, this was an education for me as well. My knowledge of Banarasi pretty much stops at Banarasi Lehenga and Banarasi Saree. I never knew there were so many variations to this fabric. The reason why I am sharing this info is that now you will know why there is such a big difference in the pricing of Banarasi Lehengas. It all boils down to the fabric used, and to a large extent the designer house as well. Please note that these are all relevant websites and stores you can make purchases from. It’s important to check the fabric material before choosing your Banarasi Lehenga or Saree. At first, I thought this is unreal. Banarasi Lehenga for under INR 6000? That’s impossible. But what you need to know is that the fabric is Art Silk a.k.a. Artificial Silk. Just to give you an idea, art silk sarees cost starts from INR 300 upwards. That’s how reasonable it is. So this particular set of lehengas is actually not pure silk banarasi lehengas. But it is made in Banaras, plus it has those banarasi prints on the fabric. Hence the name Banarasi lehengas. But knowing the fabric is key. I had posted on Instagram asking for reviews of this website and surprisingly 80% of those who answered the poll said they had good experience shopping at Banarasee. I would recommend shopping for say a pre-wedding or for your sister/brothers wedding from this portal. It might not be wedding lehenga appropriate but definitely a good budget buy. Now some of you might ask, how is Pure Katan Banarasi Silk so inexpensive? Well, the reason being this lehenga comes as unstitched fabric with 12 full handwoven Kalis. 12 Kalis is what will give you less than an A-Line flair. It would pretty much fall flat with just a tiny bit of gher. Usually, full bridal lehengas with a good flair come in the 24-32 Kalis set. Hence, the price justifies for this piece. The finest kadhua weaves, gold and silver zari, make this a regal, distinctive and wholly unforgettable masterpiece! Anything that is handmade is going to be expensive. Period. That plus the gold zari work is always slightly on the pricier side. Just to give you some perspective, a beautiful Banarasi pure silk saree is usually in the INR 15-25k range. Something your mom, aunts must have in their wardrobes. Keeping that in mind, know that no pure silk Banarasi bridal lehenga will cost you less than INR 40k for a real stunner piece. Bageecha Banaras designs beautiful handwoven tomato red jangla weave lehenga with rani pink intricate resham and zari border, paired with a rose pink boota dupatta and a tomato red blouse. Bageecha Banaras’s stunning peach Jaipuri jaal lehenga with gold zari, paired with a coral silk and brocade blouse and a yellow boota dupatta with gold zari, is an absolute must-have for pre-wedding ceremonies. Style the look with a rose hair piece and gold mathapatti. Bageecha Banaras’s lehenga in wine is absolutely stunning for your bridal day, paired with a silk dupatta in deep red with small zari bootas. Create a timeless and traditional look with a vintage silver kamarband and a pair of jhumkis with red choodis to complete the look. Buy all the three lehengas on Aashni and Co. If you are looking for those traditional banarasi prints for your wedding lehenga, then Shopping Banarasi Lehenga at Bageecha is a good idea. They are slightly on the expensive side, but designer labels come at a price. Can’t do much about it. If you are looking for offbeat shades, and contrast dupatta-lehenga combination, skip Bageecha and take a peek at Ekaaya’s collection. Both the lehenga brands have almost similar pricing and between the two stores, you have a zillion options to choose from. Mints and Blush Pinks are trending bridal lehenga colours. Brides are opting to wear these shades for their morning rituals and mostly for their pre-wedding functions. If your budget does permit you to spend a lakh on an outfit, then adding a Banarasi lehenga to your wedding trousseau is a great option. If there is one colour I would pick as a favourite this season, it’s got to be this. Yellows and mustards are making a big comeback in the bridal wear section. Naturally, yellow banarasi sarees are quite popular from where the inspiration for yellow banarasi lehengas has also started. The beautiful thick border with the contrast dupatta is an amazing choice for reusing the outfit in multiple ways in the future. This one is a complete investment piece to own. All of these lehengas by Ekaaya are Banarasi Kadwa. Kadwa as you now know is one of the purest Banarasi silks. I fell in love with this lehenga as soon as I laid my eyes upon the gorgeous dupatta. Imagine reusing this dupatta with a white or a black kurta. You can totally reuse this in the future and make use of the money spent. If you are shopping in Delhi, then you can shop Ekaaya in Defence Colony. It’s their biggest store and has everything that you can dream of. In case you wish to do some online browsing, do visit Ekaaya Website for gorgeous sarees, dupatta and of course bridal lehengas. Why does one lehenga cost much higher than the other? Now that’s something you got to check with the designers themselves. A lot of time with banarasi fabrics, the extent of handwork with zari, the time taken to make it all that adds significant cost to the final garment. That said, Ekaaya banarasi lehengas are some of the best in the industry. I personally love their collection and know that they provide excellent service to brides. As you can tell, I pretty much combed through Jayanti Reddy’s entire collection. These are some of the Latest Banarasi Lehenga Designs by Jayanti Reddy. I wish the Banarasi lehengas came with bridal blouses. These are somewhat casual funk options which are great to wear to your bestie’s wedding. However, since these are designer lehengas, I am sure one can customize and get these made into bridal pieces. Jayanti Reddy lehengas are again in the same price bracket of INR 45k to INR 1.5 Lakhs. Usually, you will find decent banarasi lehengas in the under 1 Lakh price point. You can shop her collection on various online e-commerce portals. However, the designer doesn’t release the prices of her latest lehengas online. Do you have any other recommendations for Shopping Banarasi Lehenga? Can you please suggest me some place to purchase banarasi lehenga under Rs 15,000. Banarasi Lehengas under 15k will be tough. If you see, even Banarasi Sarees start from INR 12-15k. The fabric on its own is expensive. So anything under 20k is actually dicey to go for. That said, my cousin recently purchased a banarasi lehenga directly sourced from Banaras. If you have someone who is visiting Varanasi, the prices there will be a big difference to the retail prices you see in any city. There are multiple stores in Varanasi which do both wholesale as well as retail lehengas and sarees. They are comparatively quite affordable.